Birch root burl bowls with natural edge. Root burls grow at the base of the tree, half submerged in the ground and have a birds-eye figure and rough dark bark. Dyed with 2 shades of blue. Dyed with blue and grey. Dyed Natural Edge Birch Burl Bowl, top view. Birch Burl bowl with dyed birch burl pedestal. 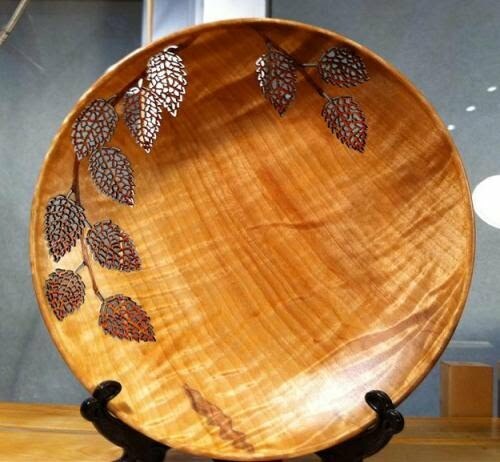 Shallow Birch Burl bowl with pierced and watercolour leaf design. Birch burl with rosemalling. This is a collaborative effort. I turned the bowl and an old Norwegian friend, Egil Lindquist, did the rosemalling. I've taken a few lessons but it takes a lot of practice to paint like that. 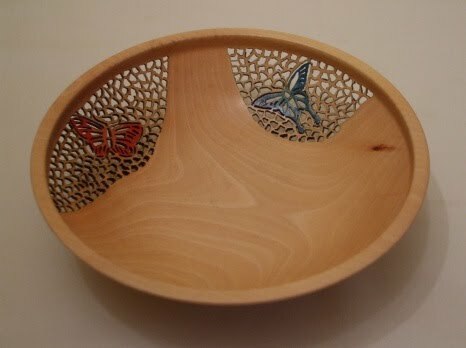 Birch Pedestal bowl with pyrography and watercolours. Birch Burl bowl with dyed rim and base. Dyed birch burl with muti-coloured rim. Birch burl bowl with blended colours dyed rim. 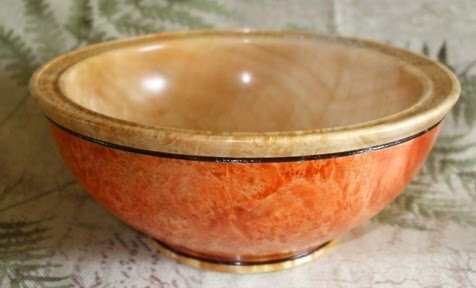 Birch burl bowl with spiral textured and dyed rim, highlighted with gold acrylic. Two Birch Burl pedestal bowls, 6 inches diameter. Natural edge Birch Burl bowl. This burl had been sitting for quite a while before I turned it which resulted in a change in colouration. Walls are 1/8 inch thick. Winged Natual Edge Birch Burl Bowl. Shallow Spalted Birch Burl bowl. A couple small Juniper bowls, about 5 inches diameter. Also known as Aromatic Cedar or Eastern Red Cedar these trees have a creamy sapwood and striking red heartwood. 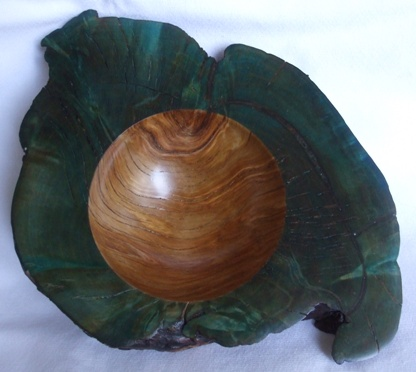 Dyed Boxelder Burl bowl. 6 inches diameter. Boxelder bowl is 1/8 inch thick with pierced and dyed maple leaf design. Boxelder goblet bowl with natural edge. My first attempt at piercing. The piercing is bordered by the rim and growth ring lines. 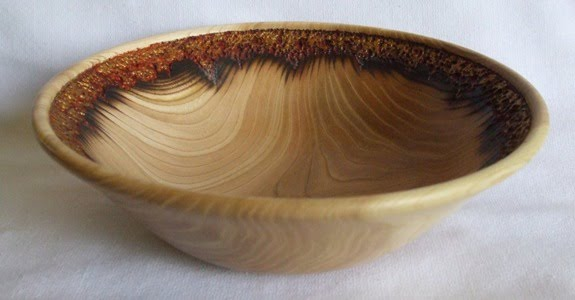 Natural edge Mountain Ash goblet bowl. Another Mountain Ash goblet bowl with natural edge. 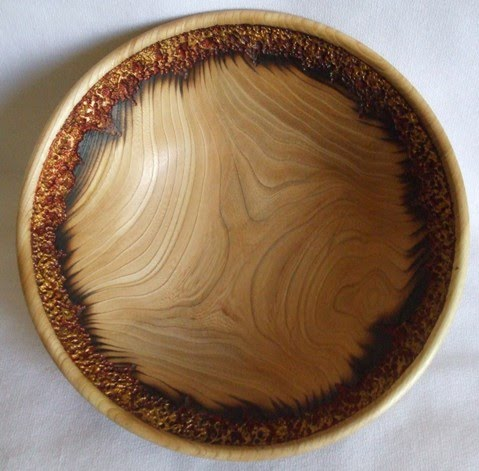 This bowl was made from a lodgepole pine that had been killed by mountain pine beetles. The blue colouration comes from a fungus that is symbiotic to the beetles. It's 10 inches in diameter with 1/4 inch thick walls. The pedestal base is dyed birch. 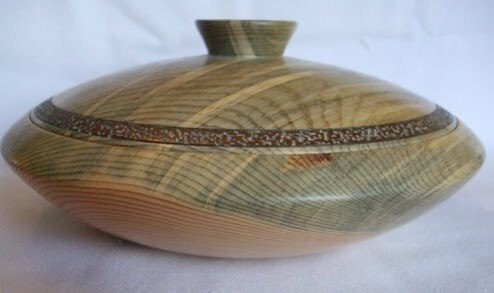 Lidded Beetle Pine Bowl, two images. Beetle Pine bowl with 1/4 inch thick walls. 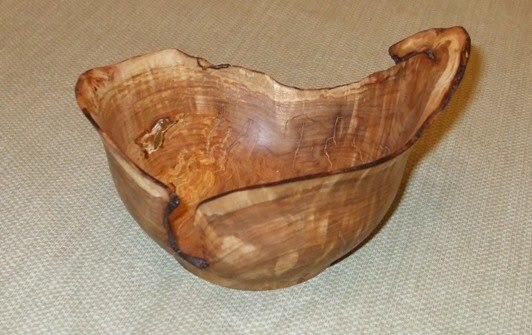 Beetle Pine bowl with rosemalling. A collaborative effort; turning by me, rosmalling by Egil Lindquist. Beetle Pine bowl with textured and dyed rim.